FIBARO Intercom can show you everyone who has arrived at your doorstep with a 180-degree high-definition view and night vision. The Intercom allows to control two gates, which might be opened using assigned PIN codes on rotating ring, holding up a phone towards the device or using dedicated app to do it remotely. Do not install the device in direct sunlight! If this happens, try to shade the device to avoid overheating and to keep the sun off the lens and reduce flare. Long-term operating in direct sunlight may cause overheating of the device, its malfunctioning, and a significant temperature rise of a housing above the limit of safe operation for the user. 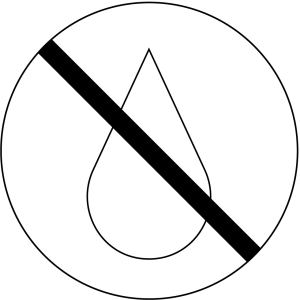 Do not mount the device in places exposed to rain or water drop, or prone to flooding. Surface around the installation box should be perfectly smooth to ensure aligning the device with the wall. Both powering modes work in parallel and may be connected at the same time with no effect on the device operation. Wired connection is recommended, but if you decided to use Wi-Fi connection make sure that the device will be in range of your router and have a good quality connection. Power supply 12V DC – used to power the device with external power supply. Ethernet – used for communication with the device and can be also used to power it using PoE Power over Ethernet. 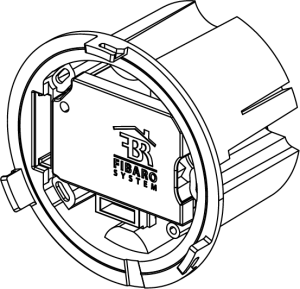 Built-in relays – can be used to open 2 gates or doors with an electric lock (via app, BLE proximity function, PIN code or physical buttons). Two buttons for built-in relays – can be used to control built-in relay using physical buttons, switches etc. Tamper – can be connected to an external system to alarm it in case of sabotage attempt. The installation wires of the unit must be lead separately from the mains power wires to prevent the transmission interference and overvoltage on the control lines. 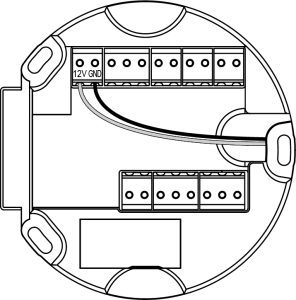 Wires inside the installation boxes should be as short as possible to prevent curling the wires and allow for easy assembling of the in-wall part. Installation wires should be carried securely and not visible from the outside, preventing from the interference by unauthorized person. 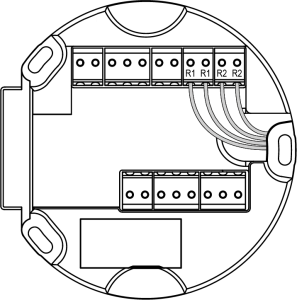 Recommended Ethernet cable for network connection is a twisted pair cable CAT-5e. The maximum cable length is 100 meters. Other inputs should be connected using the solid-core wires with cross-section from 0.14 to 0.34 mm2 (26…22 AWG). 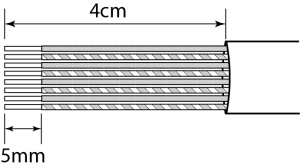 Connectors are also capable of connecting stranded wires. Close vicinity of mains (110V/230V) electrical wires may cause deterioration of the transmission through the Internet and potential noise on the inputs. Installation box must be mounted using the materials which will not cause the tension that could deform the shape of a box after the installation (e.g. by expanding). Mounting in the drywall requires using screws with hooks (not included). Mounting in the insulation-filled wall (e.g. drywall with mineral wool) requires to keep at least 10cm distance from the insulation to prevent the device from overheating. 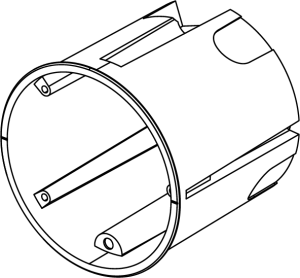 Prepare hole for 65mm x 75mm (diameter x depth) installation box. 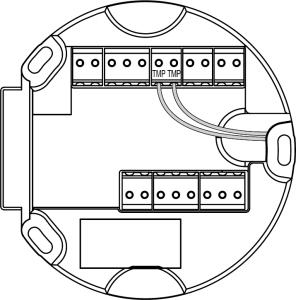 Route cables to the back of the hole (see “Choosing and routing wires” on page 8). Drag the cables through the rubber sealing on the back of the box, taking care to keep the tightness. Mount the box in the hole and align it so the TOP arrow points up. Make sure the box is flush with the wall and firmly attached. Use a screwdriver to unscrew the small screw that secures the masking cap labelled with FIBARO logo. Drag the wires through the hole located on the right of the in-wall part. Place the in-wall part of the device inside the installation box. Using three attached screws fasten the part with the box, make sure it is aligns properly and adjoins the wall. Make sure that no wires are powered. Remove the outer insulation to expose about 5 cm of the insulated inner wires, taking care not to damage them. Separate and straighten the inner wires if twisted. Cut the inner wires to 4 cm in length. Remove the insulation from the inner wires to leave about 5 mm of exposed metal core on each wire. 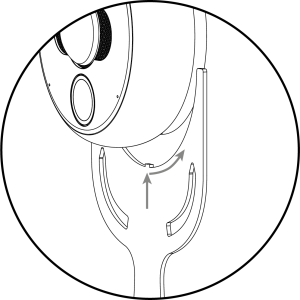 Put the wires inside the terminals using long-nose pliers or tweezers according to diagrams below. Make sure all wires are firmly attached. Should you need to remove a wire from the connector we recommend to use a dedicated tool - WAGO 2059-189 (not included, shown below) to minimize the risk of connectors damage. 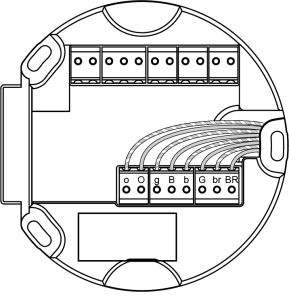 ETH1-ETH8 inputs are related to specified numbers of wires in RJ-45 connector according to the T-568B standard as shown below. Inputs for connecting an external 12V DC power supply. Please double-check correct polarity of power supply. Caution! Before connecting the power supply, or attaching the wires to device terminals, make sure that the power supply and installation complies with the limits of current and voltage. Use only Class II or double insulated power supplies and peripheral devices which provide operating in SELV (Safety Extra Low Voltage) circuits. Configurable relay outputs 30V/1A. Outputs are not designed for long-term supplying of external devices. Contacts are not connected to the ground and can be connected with any polarity. Configurable dry contact logic inputs designed to be operated by reed sensors, switches, and relay outputs. 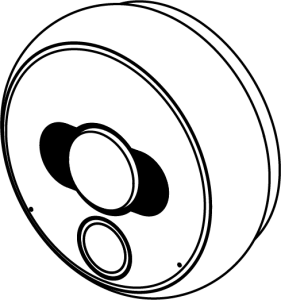 Anti-sabotage input, used for connecting to the external alarm system. Normally opened contacts close after installing the external, on-wall part of the device. Contacts are not connected to the ground and can be connected with any polarity. To find more information about potential use cases of each type of connection see “Use cases“. Install the masking cap and tighten it with a screw. At this moment you can install a SD card. 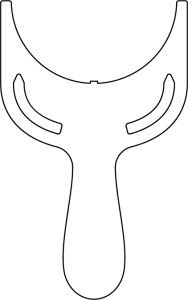 Insert the on-wall part (metal flat plate should be on the left) and align it without using excessive force. While holding the on-wall part, turn the inner black ring counter-clockwise using the included tightening tool until you feel resistance. Using the included hex key, tighten the small hex screw until it flushes with the black ring (look at the picture on the right). Be careful not to cause its deformation. The device is ready to work. You can turn on the mains power and move to device configuration guide. The device allows for installing the microSD Card for local storage of recordings. FIBARO Intercom supports up to 64 GB microSDHC and microSDXC cards, Class 10 is recommended. Before inserting the microSD Card, please ensure the direction is correct, otherwise the card and card slot may be damaged! Open the plastic cover located behind the ring. Use your finger to pull forward the latch that keeps the SD card in place. Place the SD card into the slot with the label side facing up and the gold contacts toward the slot. Close the latch and pull it back until you feel a click. FIBARO ID account (which you can set up during the configuration process). Make sure that during the configuration of FIBARO Intercom your smartphone is connected to the same network as your device. During the setup stand close to the device. Your network should be connected to the Internet at least for the configuration time. Having a valid FIBARO ID account is necessary to use your device. Such account may be created through the same app that is designed to operate the Intercom. Look below and follow one of the procedures. Read the article about the FIBARO Intercom iOS app installation. Read the article about the FIBARO Intercom Android app installation. Launch a downloaded FIBARO Intercom app. Set a password to be used for your FIBARO ID account. Verify your e-mail address by clicking a link provided in the message. After creating an account, move to Creating home. After successful login, you go directly to Creating home. In this step, it is possible to create a new home or login to existing one. Configuration takes place through BLE (Bluetooth Low Energy) protocol. Create a home and name it. 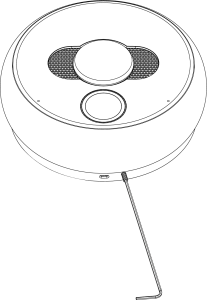 Tap Next to move to Configuration of the first device in Home section. If you log in to existing home, just select it from the list and proceed to the next step. Stand close to the device. Make sure that your smartphone is connected through Wi-Fi to the same network and Bluetooth connection is enabled. After opening the app, you will see the list of devices waiting for configuration. Info: You can see the strength of BLE signal. If the signal is too weak, try to come closer to the device. Choose the right device and name it if you want. Then, the next step is Connecting to the network. After selecting your Intercom from the list, you can establish a network connection. You can do this in three ways: via Wi-Fi or LAN (automatically or manually). it is strongly recommended to use Wi-Fi signal expanders nearby the Intercom. Choose your Wi-Fi network from the list. You can choose the network from the list or set it up manually. The list shows Wi-Fi networks in Intercom range. It is not a list of networks found by your phone. Provide a password to the network. It is also possible to set up Wi-Fi connection manually. Provide credentials of your network. After successful connection Wizard takes you straight to User Configuration. Provide necessary credentials: IP Address, Subnet mask, Gateway, and DNS. After that go to User Configuration. After successful configuration of the device (resulting in streaming the live view from the Intercom) it is strongly recommended to assign a fixed IP address of the device in your router. It makes the device integration easier. If the connection with the device is not successful, it may be necessary to reset your device to factory settings. Reset procedure is described in “Resetting to factory settings“. Type in your name in provided form and tap Next. Set your photo. You can choose it from the library or use camera. Set up your PIN Code to be used for opening the gate. Set your password for local access. Info: Local password is obligatory when you use device in network without Internet access, stream camera image and you want to integrate it with FIBARO Home Center. Network – connection mode and name of network. Verify user information and tap Finish. Intercom Web app allows to see stream and manage settings of FIBARO Intercom. Enter local IP of Intercom, click Check. Enter local login credentials, click Log in. Administrator – can configure home, add and change settings of devices and add or invite users. The administrator can fully utilize the system (calling, opening the gate, history of actions). System user – can use the device (calling, opening the gate, history of actions) and manage account’s settings (set and change name, photo, and PIN). PIN user – can only open the gate though account’s PIN. Fill the FIBARO ID user’s e-mail address in the form. After sending an invitation, new user will be visible on the list. Remember: You can only invite active FIBARO ID users. Install FIBARO Intercom App and log in to the FIBARO ID account (the same that the invitation was sent to). After logging in you can see a Home list and the one that user is invited to will be marked. After choosing a home, the next step is User Configuration. Invited user’s permissions is system user by default. There are two ways of performing the reset of the device: through the mobile app or directly using the device. After completion, the Intercom will be restored to factory settings. Please notice that all stored recordings will also be removed! Find Status and tap it. Tap Reset to factory button. Press and hold the ring and the button at the same time for about 10 seconds. Release both when the device glows in red. Enter the last 8 digits of serial number using the rotating ring. Confirm each number with a short press of the ring. Entering correct serial number will be confirmed by glowing in green and restarting. 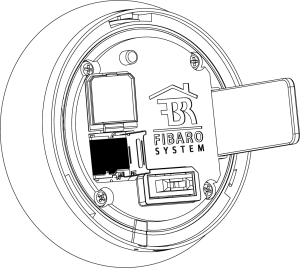 FIBARO Intercom allows to use rotating ring for entering PIN Codes set during the configuration process. Correctly entered PIN code may result in authenticating the user and opening the gate. Anyone who does not have a PIN code may use the button on the front to make a call. Move your hand close to the device – the button will light up in blue. Rotate the ring to select the first digit of your PIN code – numbers will light up one by one. Push the ring to confirm selected digit. 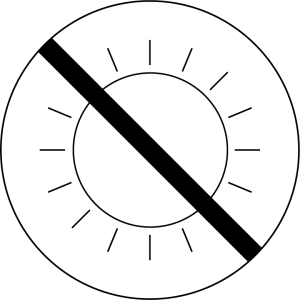 Correct entering of the digit will be confirmed by turning off the backlight. Enter next digits of your PIN code in the same way. If you entered incorrect digit, pull the ring to cancel the entire sequence and start again from the 1st digit. After selecting the last, 4th digit, make a single push to open the gate connected to the first relay (R1). Make a double push to open the gate connected to the second relay (R2). The PIN code will be verified. In case of successful verification, all diodes will blink green five times and the gate will be opened. Entering incorrect PIN code will be indicated by two blinks in red. The default time for which the gate stays opened is 3 seconds. Its length may be adjusted by the admin through the mobile app. The gate may be opened by using the Bluetooth low energy proximity sensor. In order to do so, move your paired smartphone with enabled Bluetooth connection close to the device. LED diodes will start flashing – wait for a call. If no one responds to your call, you will be able to leave your message in the voice mail. Enabling the voice mail is indicated by the red button backlight, numbers flashing in red and a beep. Maximum length of the voice message is 30 seconds. The Intercom is equipped with a LED Illuminated dial and button which can signal the device states, modes, and errors. 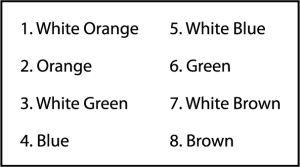 There are 7 possible combinations. What does mean that the device has IP54 protection class? IP Code defines the level of protection against water and dust(according to IEC/EN 60529 standard). First digit refers to solid particle protection and 5 means the device is protected from dust, but not tight. Second digit refers to liquid ingress protection and 4 means the device is protected from splashing water, but not water jets. Do I need Home Center or other gateway to use the device? Is the device compatible with Z-Wave? No, Z-Wave protocol does not allow to stream video data. Is the device compatible with HomeKit? No, HomeKit protocol is not supported. Which smartphone app should I use to control the device? Use iOS app called (Fibaro Intercom). Android app will be available soon. Can I integrate my device with FIBARO System? Yes, buy using plugin. It allows to view camera image, start recording and open connected gates. Additionally Intercom can be used in scenes. Can I use more Intercoms in one house? Can I stream the camera image to other devices? Your local access login credentials. Does the Intercom use SIP protocol? What are the viewing angles of the Intercom? 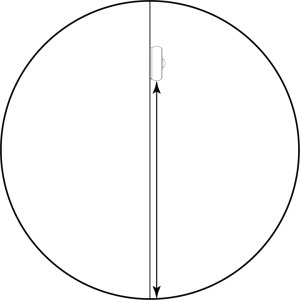 180° vertically and 120° horizontally. Remember that the app will show different angles depending on the orientation of the screen. Does the device uses dewarping? Yes, but it can be disabled. Dewarping is a process of correcting perspective distortions caused by the shape of camera lens. Does the device uses HDR? Yes, but it can be disabled. HDR (high dynamic range) image is an image with higher dynamic range. It emulates human perception, allowing for brighter shades and darker highlights. Why the Intercom app requires Bluetooth to be enabled? The app uses Bluetooth proximity detection to open the gate, but it can be disabled in app settings. Do I have to use installation box included with the device? Yes, it's an integral part of the device.